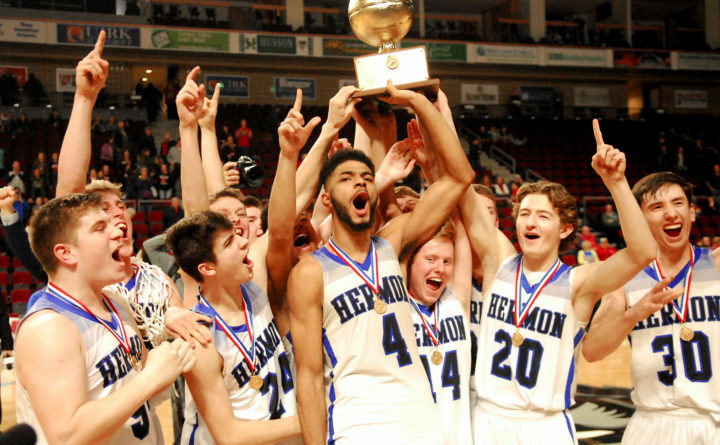 The Hermon High School boys lift the gold ball high after defeating Wells for the Class B boys state championship at the Cross Insurance Center in Bangor on March 2, 2018. Basketball fans around eastern Maine are familiar with the top guns on the undefeated Hermon High School boys basketball team. Seniors Cody Hawes and Garrett Trask, and junior Isaac Varney all were pivotal contributors to last winter’s Class B state championship season. The top-ranked Hawks, 11-0 after Wednesday’s 62-28 win over John Bapst of Bangor, have won 33 consecutive games. At they prepare for Friday night’s North showdown with No. 3 Mount Desert Island of Bar Harbor (8-2), they are not only comfortable with their starting lineup, but also with their depth. “Our group in general practices really hard every night, and a lot of times our groups are mixed. I’m constantly mixing groups for practice. It’s not like I’ve got five guys who play together all the time in practice,” Hermon coach Mark Reed said. “There’s been a lot of growth in a lot of our younger players all year long and they’re continuing to improve. We’ve got great depth,” he said. Seniors Kent Johnson and Joel Bergeron have joined Hawes, Trask and Varney in the starting lineup this winter. The sharpshooting Johnson and the three returning starters are double-figure scorers, while Bergeron ranks among the team’s top rebounders. That group is supported by a productive bench, led by senior forward Dylan Leighton and sophomore guards Wyatt Gogan and Eli Reed, that has added 21.5 points per game for the Hawks. “We’ve been working on being able to go deeper into our bench so people like Isaac, me, Garrett — everyone really — can get an extra break when they need to,” said Hawes, a point guard who is averaging 11 points, 7.1 rebounds and 6.0 assists. “Especially when we’re in foul trouble, it’s good when they can step up and be big for us,” he said. Coach Reed has found that different matchups can result in different players stepping up from game to game. “It’s just a matter of trying to find the right rotation every night, and the consistency factor and chemistry is a big part of it,” he said. “You’re always telling the guys that you just never know when you’re going to have to step up and fill a void, so you’ve got to be ready all the time in case that happens. Varney inadvertently was assigned a teammate’s foul with 2:03 left in the first half of last Saturday’s game against Oceanside — the rematch of Hermon’s 97-94 triple-overtime victory over the Mariners at Rockland on Dec. 21 — and it turned out to be his third foul of the game. Varney, who averages 12.8 points, 7.9 rebounds and 3.4 assists, not only sat out the rest of the half but was also able to sit out the third quarter without taking the risk of drawing his fourth foul. That came after the Hermon reserves came up big, particularly Eli Reed. He scored eight of his 13 points in the quarter as the Hawks were extending a 19-14 halftime advantage to 41-29 entering the fourth period. “Tonight was a situation where Eli came in and made a big impact, but tomorrow it might be someone else,” coach Reed said after the game. “This was a game where Dylan Leighton, who normally plays more minutes and matchup-wise can do good things for us and normally is a good shooter, just didn’t fit into the scheme of things because they kept subbing in guards. While Leighton wasn’t a major on-court presence during Hermon’s 58-49 win over Oceanside, Reed said his contribution as a teammate was equally important. “I talked in the locker room afterward about Dylan and what a great job he did as a senior in a game when he wasn’t getting as many minutes as he usually does. Instead he was our best cheerleader on the bench because at the end of the day he just wants to win, and those things go a long way toward where you want to be at the end of the season,” he said.